An English bulldog plays a minor role in the new production of “The Threepenny Opera” that opened at the Atlantic Theater Company on Monday. Romeo is his name, and he acts very naughty in the tableau that opens the show, slobbering away at the leg of a streetwalker who’s passed out flat on the ground. Still, Romeo is as cute as can be and looks as if he wouldn’t have a mean bite, even if, say, you slapped a tiara on his head and asked him to do his best impression of Queen Victoria. 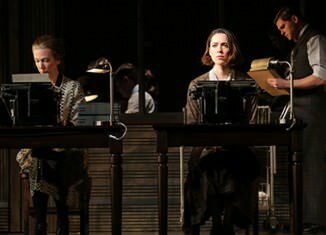 Unfortunately, this chic-looking but pallid staging of Bertolt Brecht and Kurt Weill’s scabrous musical drama is also pretty toothless. Directed and choreographed by Martha Clarke, the production moves efficiently and with a stylish gait through the underworld of London thieves, beggars and whores scheming to get ahead in a cutthroat world. At just over two hours, with intermission, it’s certainly the thriftiest “Threepenny Opera” I’ve yet seen. But while Ms. Clarke does a fine job of composing decadent yet decorous stage pictures, she doesn’t seem able to elicit performances with the requisite salty tang from her talented cast, which includes F. Murray Abraham as the king of the pickpockets, Mr. Peachum; Mary Beth Peil as his wife; Laura Osnes as his daughter Polly; and Michael Park as the murderous thug Macheath, also known as Mack the Knife.